A new book called "What's It Like in Space?" (Chronicle, 2016) is fairly self-explanatory: It's a book filled with short anecdotes from astronauts about, well, what it's like to be in space. Simple as that may sound, many of the stories in the new book cannot be found on NASA's website or in other books and papers that describe the experience of spaceflight in a technical way. "What's It Like in Space? Stories from Astronauts Who've Been There" reads less like a collection of facts and more like a candid conversation with an astronaut. And that's exactly what the book's author, Ariel Waldman, said she was going for. 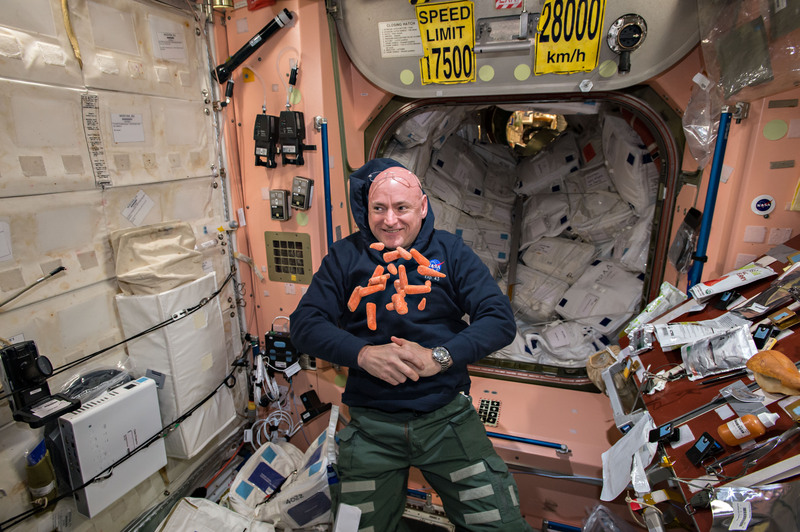 The stories Waldman shares in "What's It Like in Space?" include factual information; for example, it is basically impossible to burp in space without also throwing up. The lack of gravity means gas doesn't rise in the stomach; it's just mixed up with everything else. But Waldman's book also shares a story from astronaut Jim Newman, who figured out a way to get around this problem by pushing himself off a wall, creating a sort of artificial gravity in his body that allowed him to belch without also losing his lunch. "If you ever have the opportunity to talk to an astronaut ... they're delighted to tell you these funny stories that, you know, they might not say on a huge stage, but they're happy to tell you in person one on one," Waldman said. The weightless environment of space puts a lot of stress on the human body, so it is understandable that many of the stories in Waldman's book involve bodily functions (and it does seem unlikely that an astronaut would ever speak these tales into a microphone in front of a crowd). There's a story that explains how vomiting in a spacesuit (a regular occurrence) causes the upchuck to ricochet back into the astronaut's face; another claims that multiple astronauts have attempted to propel themselves in microgravity using their own farts. In another story, Waldman said multiple astronauts have confessed to eating the freeze-dried shrimp cocktail for every meal for weeks because it's the only food that retains its texture and flavor through the freeze-drying process. The added horseradish also helps with unclogging sinuses (a common problem for astronauts). The book, which is about 6 inches (15 centimeters) square, has an illustration by artist Brian Standeford paired with each story. The size of the book and the addition of illustrations have made some people assume the book is for children, Waldman said. She didn't have a specific audience in mind when writing the work, she said, but was just trying to answer what she found to be the single most common question people ask astronauts: What's it like in space? "For a kid, they might want a different answer [to that question] than an adult might want, but everyone has the same question," Waldman said. "Certainly, I think some people think stories about bodily fluids clearly must be for children, but in my experience adults are just as fascinated with it." Some of the stories in the book are somewhat antithetical to the extremely dignified image of astronauts that NASA typically portrays. These people are presented as the epitome of professionalism -- and they are. But space is a humbling environment. It's a place where the comforts of Earth -- showers, laundry, a regular day and night cycle -- are gone. Meanwhile, the body undergoes incredible stress, and the astronauts are locked together in a series of trailers. Waldman's book is a great reminder that the people who go to space are incredibly smart, strong, talented and, most of all, human. On her first trip off the planet, space tourist Anousheh Ansari left something floating in the area around her and lost track of it. Worried it would clog up the expensive ventilation system, she confided in a crewmate about her supposed mistake. The astronaut showed Ansari a fan that acted as a "lost and found" by slowly sucking up loose items. Even the most experienced travelers would have to go fish something out of it from time to time. "I think I like the stories where we want to say, 'Oh, there's all these things that we don't know about space,' but sometimes there's just things that we don't know about ourselves," Waldman said. Waldman said she got the idea for the book in late 2014, shortly after she finished up a stint serving on the National Academy of Sciences (NAS) Committee on Human Spaceflight. Job-wise Waldman may best be described as a professional (and extremely productive) space enthusiast. She's the founder of Spacehack.org, a directory of projects and other ways that people can participate in space exploration. She sits on the council for NASA Innovative Advanced Concepts, "a program that nurtures radical, sci-fi-esque ideas that could transform future space missions," according to her book bio. These are just a few of the ways she's connected people to space. Working on the NAS human spaceflight committee, Waldman said she had the opportunity to talk to astronauts in an unofficial capacity, and gradually accumulated a trove of those won't-be-told-on-a-big-stage stories. Waldman said she would tell these stories at parties and social gatherings, where they were always a big hit, and she decided to put them out to a wider audience. She interviewed a dozen astronauts for the book, and also sought out appropriate stories from archived interviews and talks by astronauts. "So far there's only 550-ish astronauts in the world, which is sad, [and] not everyone gets the same privilege to meet them and get these stories," she said. "So this little book is a way of sort of getting those stories out there, making [them] more accessible to everyone." Waldman said the book is also her way of acknowledging that, hopefully, many more people will travel into space in the coming decades, as commercial companies prepare to do what only government space agencies have accomplished in the past. "Hopefully, there will be more astronauts in the coming years, and we'll have more really funny stories like this, and books like this won't be so unique anymore," Waldman said. "[That] is sort of my hope." "What's It Like in Space? Stories from Astronauts Who've Been There" is now available online, and will be on bookshelves May 1. Follow Calla Cofield@callacofield. Follow us@Spacedotcom,Facebook andGoogle+. Original article onSpace.com.